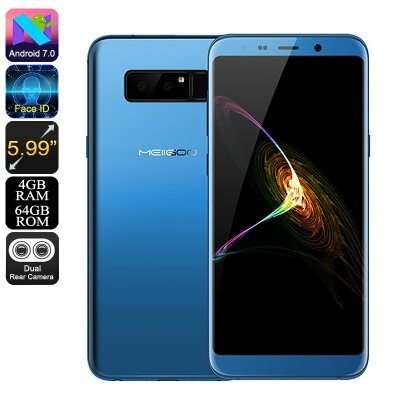 Successfully Added MEIIGOO Note 8 Android Smartphone - 5.99 Inch Screen, Android 7, Octa Core CPU, 4GB RAM, Dual SIM 4G, Dual Rear Camera (Blue) to your Shopping Cart. 5.99-Inch screen with 2160x1080 resolutions its a movies lovers dream come true. Octa Core processor and 4GB of RAM deliver a smooth performance for gaming and multitasking. Dual SIM 4G connectivity brings lighting quick upload and download speeds for streaming movies and online games. 64GB of internal memory and 256GB external storage support ensure memory space is never an issue. The MEIIGOO Note 8 aims to imitate the success of the Samsung flagship phone by offering the same stylish design with a good spec lineup but for a fraction of the price. For anyone tempted by the Note 8 but without the required budget, the MEIIGOO Note 8 could hit the spot. With a metal body, a 5.99- inch screen, and 3.0D curved glass the MEIIGOO Note 8 certainly looks the part. The rear has a dual lens camera setup and fingerprint scanner while the bottom of the phone has twin speaker output and the type C USB port. The screen is fairly impressive in itself as it has a 2160 by 1080 resolution so you will be abet to enjoy games and movies in rich detail. When it comes to performance the MEIIGOO Note 8 is well equipped. A MediaTek Octa-Core CPU with 4GB of RAM and the Mali T860 MP2 GPU is fairly impressive and delivers a fast performance even when multi-tasking or running graphics rich games. With 64GB of internal storage and the ability to expand that by up to 256GB with a micro SD card, you should have plenty of space for al the games, media, apps, and movies you desire. The Note 8 from MEIIGOO has two SIM card slots and both are enabled with 4G. The two SIM card slots are helpful if you want t manage your business and personal contacts on the one device or can be used with different cellular providers for extensive coverage and avoiding roaming charges. Keeping you going through the day is a 3300mAh battery. This brings reasonable usage times and with the USB type C port, it can be quickly recharged whenever you need. This MEIIGOO Note 8 smartphone comes with 12 months warranty, brought to you by the leader in electronic devices as well as wholesale Android phones from China..